In the previous beginners guide I explained half of the Shipping settings. Today I'll be guiding you people about how to configure the two remaining options termed as Local Delivery and Local Pickups. So, let's get to it. Shipping via Local Delivery means that you will deliver items to your customers locally, i.e. within the geographical boundaries of your base location within the same city or country. WooCommerce allocates a separate section for this type of shipping. Let's see how you can configure it. 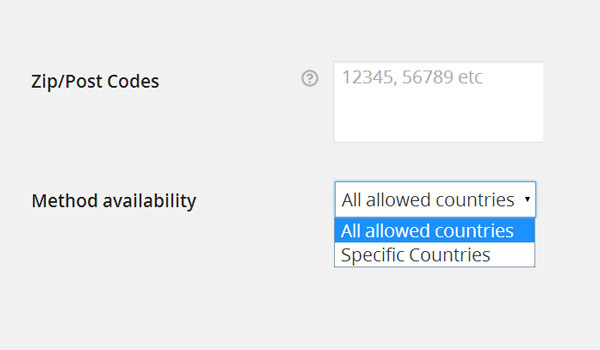 Enable: This is used to Enable/Disable this shipping option. Title: Set the title of this form of shipping for the front-end display. The default setting is an unmarked Enable/Disable checkbox, while Local Delivery is the Title. The next two fields, Fee Type and Delivery Fee, are dependent upon each other. 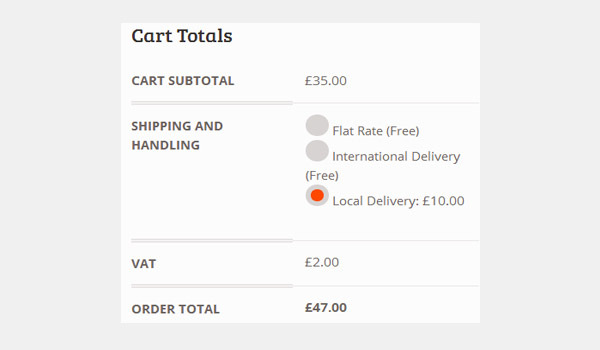 Fee Type: This manages how the delivery charges for local shipping are calculated, and offers various options through a dropdown menu. Delivery Fee: This quotes the exact amount that a store owner will charge customers if they select local delivery as their method of shipping. 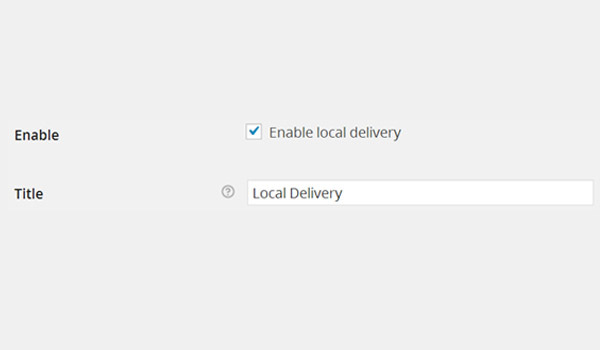 Let me explain the role of these two options in Local Delivery shipping via examples. Consider three cases. Case 1: Fee Type = Fixed Amount & Delivery Fee = 10. Fixed amount means that a standard rate will be charged to customers for the delivery of their product. In the above figure you can see that the cart page displays £10.00 as a fixed rate for local delivery. So the actual product price was £35.00, and when this fixed amount is added (i.e. £10.00) along with the VAT value (£2.00), the total cost of the order becomes £47.00. Case 2: Fee Type = Percentage of cart total & Delivery Fee = 10. Percentage of cart total means that whatever you write in the Delivery Fee field will be considered as a percentage value and the delivery charges will now apply as a percentage of the item price/value. 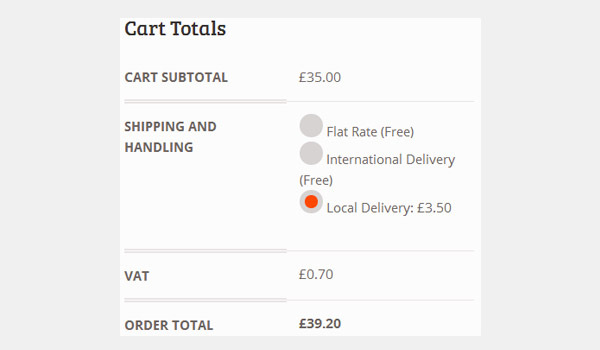 In this example we have set Delivery Fee = 10, which corresponds to 10%. So charges for local delivery will be calculated by "10% of cart total" i.e. 10% of £35.00 = £3.50. Similarly, in Case 1 VAT was £2.00, and now VAT becomes £0.70. All these costs generate a total price of £39.20 (i.e. £35.00 + £3.50 + £0.70). Case 3: Fee Type = Fixed amount per product & Delivery Fee = 10. 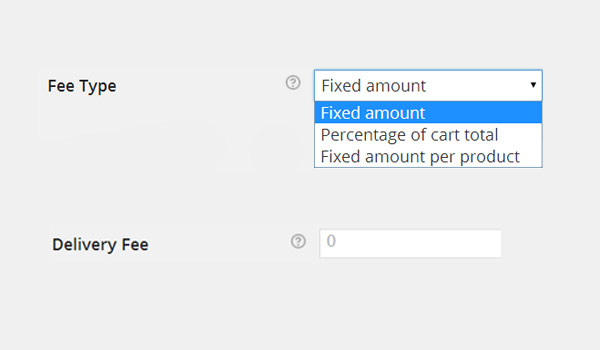 This option for Fee Type is somewhat similar in function to Fee Type=Fixed Amount, because with this option a fixed amount will be charged on every product. 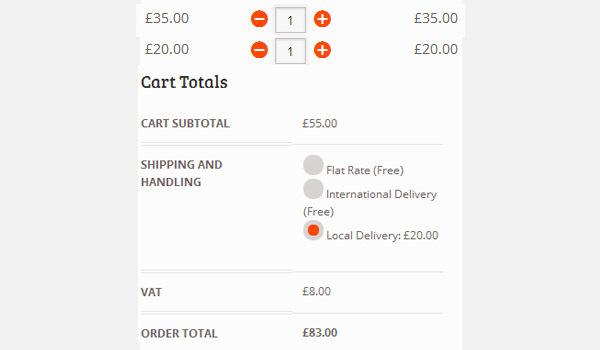 The figure above shows that two products are there in the customer's cart worth £35.00 and £20.00. This means a delivery fee of £10.00 will be imposed on every product. Hence, the total cost of local delivery becomes £20.00. Similarly, VAT will apply separately on every product, so that now becomes £8.00. The total cost of the order becomes £83.00. Make sure you click the Save Changes button after every configuring every option. In the last two fields you will specify all those Zip/Post Codes and Countries where you will offer shipping via local delivery. You can add multiple codes, each separated by a comma. In my opinion the least preferred method of shipping is Local Pickup, where customers have to come and collect their products directly from the store owners. This shipping service nullifies the concept of an online store. Despite all these facts, WooCommerce offers Local Pickup. The default setting is an unmarked Enable/Disable checkbox with Local Pickup as the Title. As no additional charges or geographical boundaries are involved in this type of shipping, the settings in this section are quite simple and straightforward. The figure above shows various options which can be configured. 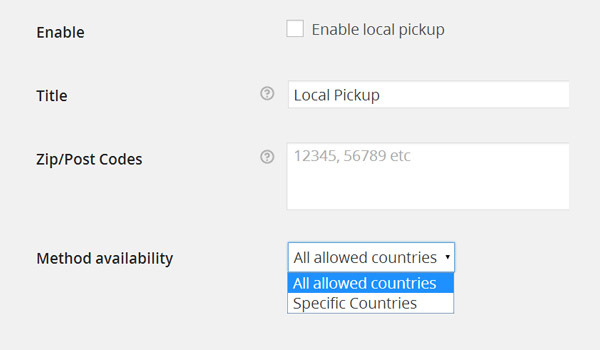 Quite similar to the last shipping settings, in the last two fields you will specify all those Zip/Post Codes and Countries where you will offer shipping via local pickup. You can add multiple codes, each separated by a comma. In the next article I will start configuring the Accounts section in WooCommerce. Till then if you have any query regarding the shipping settings you may ask in the comment box below. Cheers!